The Hand of the One tilling the soil is the One Who loves it the most and sees the greatest potential in it for harvest. The roots beneath the surface must be ripped out that the ground might be tilled and furrowed, giving room to accept the seeds of growth. Open your eyes and see as I see. I see beautiful golden fields of wheat, waving their ripened grain in the breeze, ready for harvest. The deep furrows made upon your soul serve only to open it to receive the words, comfort, love, healing, and power of the Lord that they may take root and flourish with a crop of tasty fruit. God is the Master Husbandman Who sometimes must dig deep into one’s life, knowing where the best soil lies, and dropping in His seeds of encouragement, peace, and blessings that they may grow for the use of others. 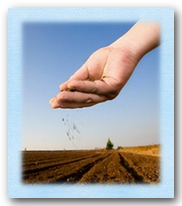 The Husbandman knows His soil and purposes to have a harvest. Allow Him to do His tilling in your life and to plant the seeds of Word into your heart that you may give back to Him that bumper crop. Wonderful post, Lynn. What a great reminder that God is doing continued work in us so we can be used for His purposes! Beautiful indeed! This was a beautiful explanation of the parable of the different soils. A parable is an earthly story with a heavenly meaning and you did well to explain it so that someone could understand. I used to get frustrated when I would work so hard to try to bring someone to the saving grace of God only to feel slighted if someone else did it first. But then I realized that many times my job might be to plant the seed so that someone else can come along and cultivate it or vice versa. I tell people to bloom where they are planted but only if the Lord has put them in that soil. A friend told me to bloom in a flower pot if that’s where God had planted me, and stop worrying about where to put down roots ’cause He might plan to move the pot. Thank you, sweet Mommy! Your comments are always precious to me. Bless you! Oh, thank you, Gigi. You are such a precious new friend. I deeply appreciate your comment. Be blessed! LOL! Sheila, I love that. Too funny and yet so true. Have to remember that. I always love having your comments. Blessings to you! What a beautiful post! We do need to let God prepare us to receive the seed of His Word and be fruitful in our lives. This is a wonderful parable, and your explanation of it helps make it clearer and even more meaningful, Lynn. Really thoughtful post Lynn.It’s so easy to just think of it as a picture to help us when we talk about Jesus, and they are not interested, but it’s so much more personal than that. Such a clear explanation, as always! What a blessing you are. Wonderful post. I enjoy stopping by to see what wisdom you have to share from God for the day. I recommended your blog to my readers.